Fibro Files: How does Fibromyalgia differ from Chronic Fatigue Syndrome? 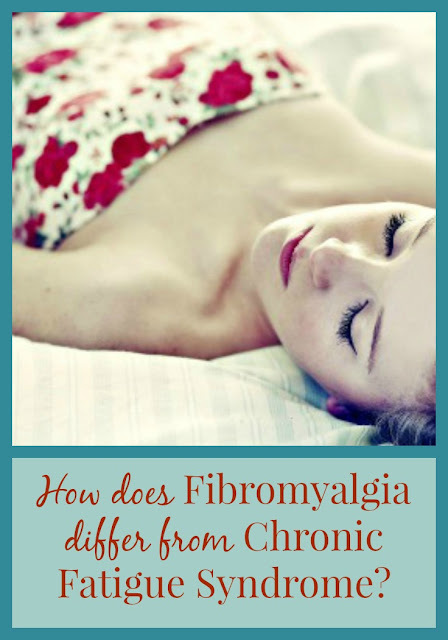 How does Fibromyalgia differ from Chronic Fatigue Syndrome? Fibromyalgia Syndrome (FMS) and Chronic Fatigue Syndrome (CFS) have many symptoms in common. Research has found that there is a fine line between these 2 syndromes and the Arthritis Foundation says that between 50 to 70 percent of those with FMS fit the criteria for CFS. The main difference between FMS and CFS are the symptoms of pain and fatigue - FMS is thought to have more widespread pain and CFS more fatigue. When diagnosing CFS a doctor should expect a few differences. Do the differences really matter? In my opinion, and I am not a doctor, the differences do not matter because there is no cure or magic pill for either disease only treatment of the symptoms. The treatments that are tried are very similar and include lifestyle changes such as pacing, sleep therapy and gentle exercise, pain medications and antidepressants. You can read about many of these treatment options on this site by looking through the list of articles. I personally always think of stress as something that builds up over time. I agree with you, Jools. I too didn't have a huge traumatic event, just lots of stress. I'm blessed to have a great family that helps to relieve as much stress as possible at home. It helps, but I still feel bad for not doing it myself like I used to be able to do.